Ahmed graduated from Barts and the London Medical School in 2005, having also accomplished an intercalated BMedSci (hons) degree in Molecular Therapeutics. He attained membership of the Royal College of Physicians in 2008 and went on to achieve a National training number in Cardiology at the West Midlands Deanery. Since then, he has worked for three years as a cardiology registrar in Birmingham and Coventry. 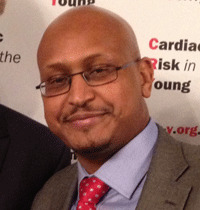 In 2012, he successfully obtained a competitive grant from CRY – Cardiac Risk in the Young – to pursue an MD degree at St. George’s, University of London. His research interests are on sports cardiology and in particular the effects of chronic endurance training on the Veteran Athlete. In his free time, Ahmed enjoys playing basketball and is currently a member of the St. George’s Basketball team. He also has a passion for watching and playing football.